(Fort Worth, TX – February 25, 2013) – The Lighthouse for the Blind of Fort Worth announces today that they will host, #1 New York Times bestselling author and World Trade Center survivor, Michael Hingson, to come to Fort Worth for a week-long series of appearances from Monday, February 25th through Sunday, March 3, 2013. Hingson has graciously offered to come to Ft. Worth for the week and to speak to a wide variety of different audiences throughout his visit. Michael Hingson, who has been blind since birth, is an internationally renowned public speaker and bestselling author of, Thunder Dog: The True Story of a Blind Man, His Guide Dog & the Triumph of Trust at Ground Zero. The Lighthouse recognizes that Hingson has an incredible story that needs to be told. According to Hingson, he will present his story of survival and will teach from first hand experience that “blindness is not the handicap we face, but rather the handicap consists of the misconceptions that people have about blindness”. When asked about his upcoming trip to Ft. Worth, Hingson said, “the amazing part of my story is not that I happen to be blind and descended from the 78th floor with the help of my guide dog, Roselle, but that so many people survived that day by not panicking and by working together as a team to escape the tower.” “My story is not so much about how I escaped from the World Trade Center, but how I got there in the first place and what has happened since”. Hingson describes his personal mission, “My work today is to change peoples attitudes and perceptions about blindness, from being a tragedy to just being a challenge—like being left handed or even like being light dependent, a disability most people face”. Hingson will speak to thousands of people while in Ft. Worth, all as a gift to the city, from the Lighthouse for the Blind. “Some of his audiences will be blind, some will be sighted. No matter which, his story is inspiring,” explains Platt Allen, III, Lighthouse President/CEO. Arriving in Fort Worth on February 25th, Hingson will visit eight schools and will make 10 presentations to students during the week. A private, by-invitation-only event hosted by the Lighthouse will take place on the evening of February 27th, at McDavid Studio. Another private event will take place Saturday, March 2nd, at the Fort Worth Museum of Science and History and will be exclusive to children and youth who are blind and their families. For additional information on these particular events, contact Nancy Fisher at nfisher@lighthousefw.org or at 817-332-3341, ext. 7782. Additional private engagements include appearances at the Lighthouse for the Blind of Fort Worth, North Texas Radio for the Blind, and downtown Rotary. Michael Hingson will also be featured in three free community events. The first of which will happen on Tuesday evening, February 26th at 6:30 p.m. on the TCU campus. Hingson will be speaking on the Club Level, west side, in the Amon G. Carter Stadium. The presentation is free and is open to all TCU students, faculty/staff and the general public. Free parking is available in Lots 1 and 2, located on the west side of the stadium and off of Bellaire Drive North. Guests can enter the facility via the Champions elevators on the south west corner of the building on the west side of the stadium, Gate 2. On Thursday evening, February 28th, Hingson will speak in the downtown area at Tarrant County College District-Trinity River Campus, beginning at 6:30 p.m. This event is opened to all TCCD students, faculty/staff and the general public. There is no charge but a parking permit is required for parking in the TCCD garage. Contact Nancy Fisher at nfisher@lighthousefw.org for the parking permit, directions to the campus and for any additional information. In his final Fort Worth appearance, Hingson will bring his story to First United Methodist Church, downtown Fort Worth, 800 West Fifth Street, 9:30 a.m. to 10:30 a.m., Sunday, March 3rd. He will be speaking in Wesley Hall. This opportunity is open to the general public. The press is invited and encouraged to attend any of Michael Hinson’s speaking events. Michael Hingson is available for interviews. Please contact Celia Black at 425-512-7453 or celiablack@michaelhingson.com to arrange media appearances. Since 1935, Lighthouse for the Blind of Fort Worth has made a life-changing difference in the lives of individuals who are significantly visually impaired by providing skills enhancement, training and employment that empowers them to achieve their highest level of personal, economic self-sufficiency. The Lighthouse’s Industrial Division employs over 80 individuals who are legally blind to manufacture products such as energy dissipation pads, graffiti remover, hygiene kits, non-incendiary LED marking flares, fast pack shipping containers, copy paper and clear-barrel pens. Products are available for sale to commercial businesses as well as to local, state and federal government agencies. In addition to the industrial division, rehabilitation services provide mobility and orientation training, skills assessment, and independent living skills training to over 3,000 individuals annually. For more information about Lighthouse for the Blind of Fort Worth or to take a tour of the 80,000 square foot facility, contact Nancy Fisher, Community Development, nfisher@lighthousefw.org or 817-332-3341, ext. 7782. Baltimore, Maryland (February 19, 2013): The National Federation of the Blind, the oldest and largest nationwide organization of blind people in the United States, today applauded the introduction of S. 346 by Senator Jon Tester (D-MT) and Senator Dean Heller (R-NV). If passed, the bill will reverse the exclusion of 100 percent service-disabled veterans from the military’s Space Available program, which allows active-duty military, Red Cross employees, and retired members of the armed services to travel on military aircraft if there is space available. A companion bill, H.R. 164, has been introduced in the United States House of Representatives by Representative Gus Bilirakis (R-FL). The National Federation of the Blind (NFB) is the oldest, largest, and most influential nationwide membership organization of blind people in the United States. Founded in 1940, the NFB advocates for the civil rights and equality of blind Americans, and develops innovative education, technology, and training programs to provide the blind and those who are losing vision with the tools they need to become independent and successful. We need your support. To make a donation, please go to www.nfb.org. Baltimore, Maryland (February 13, 2013): The National Federation of the Blind, the oldest and largest nationwide organization of blind Americans, commented today on the State of the Union address delivered by President Obama yesterday evening, focusing particularly on the president’s call for a raise in the federal minimum wage. For President Maurer’s full comments, please visit https://nfb.org/blog/vonb-blog/what-remains-unsaid-about-minimum-wage. Last night during his State of the Union address, President Obama described the need for better education and training in order to build a more qualified workforce. He went further to describe how the current minimum wage leaves many hourly workers, particularly those with families, earning wages below the poverty line. He argued for more investment in the training and education of the workforce, and for raising the federal minimum wage from $7.25 to $9.00 an hour. The same moral and economic arguments being used to justify a lifting of the minimum wage apply to workers with disabilities, about 300,000 of whom are currently being paid wages significantly below the federal minimum wage and the poverty line. Workers with disabilities also need a living wage that raises them out of poverty and dependence on public assistance, and allows them to contribute to the economy by spending the money they have earned. For over seventy years, certain employers have capitalized on the misconception that workers with disabilities are not productive enough to earn the federal minimum wage. Section 14(c) of the Fair Labor Standards Act was supposed to have been enacted as a compassionate offering for workers with disabilities to earn wages commensurate with their productivity. In actuality, it is a manifestation of what another president, George W. Bush, called “the soft bigotry of low expectations.” The National Federation of the Blind and other organizations of Americans with disabilities are working to remove the veil of false compassion currently being used to justify the payment of subminimum wages to workers with disabilities. Until we expose this provision for what it is—discrimination wearing the mask of pity—some employers will continue to refuse to implement the proven innovative training and employment strategies that allow those with even the most significant disabilities to engage in competitive integrated employment. Moreover, the 300,000 people with disabilities currently being exploited by subminimum wage employers will always remain public beneficiaries and never achieve real employment. The president said last night: “We may do different jobs, and wear different uniforms, and hold different views than the person beside us. But as Americans, we all share the same proud title: We are citizens.” We would add that some of us are blind, deaf, or have mobility impairments or developmental delays. However, we are not broken people. “That’s just how we are made.” We may look different or do things differently, but each of us has the potential to make a real contribution to society. We, too, are citizens. We believe that the 300,000 American citizens with disabilities currently employed at subminimum wages have the capacity to be productive, competitive employees who deserve the same workforce protections as the millions of other nondisabled American citizens. Similarly, as long as there is a federal minimum wage guarantee for nondisabled employees, workers with disabilities should have the same minimum wage guarantee. All citizens, including those with disabilities, must be accorded the same rights and protections. Equality is part of our American creed, and as we write what the president called “the next great chapter in our American story,” we must, at long last, apply our belief in equal treatment and equal opportunity to Americans with disabilities. 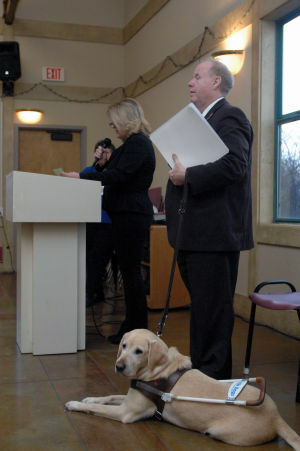 On January 24, I spoke to 120 people (and 2 guide dogs in training) at St. Charles Borromeo in Livermore and Carole Graham from The Independent wrote and article that I thought was very well done, so I wanted to share The Independent Article it with you here. I appreciate this very well written article and hope you all enjoy it as well!